Home » News » National Neighborhood Watch offers a new way for families to reduce their risk of burglary. National Neighborhood Watch offers a new way for families to reduce their risk of burglary. Sweet Home Ore., June 8, 2018 News/Release: The National Neighborhood Watch offers a new way for citizens to reduce their risk of burglary. It’s called Super Grip Lock a patented $10 deadbolt accessory that stops anyone from unlocking your door at home or when staying in a hotel or motel. Super Grip Lock does not work on every deadbolt, but it works on most deadbolts including the card locking systems used in hotels and motels. It prevents bump keys, passkeys, lock picks or duplicate keys from unlocking the door. It works instantly to reduce the risk of a burglary at home or when traveling. Locksmiths, travel agents, landlords, online marketers or others can buy wholesale to reduce the risk of burglary for their customers, or tenants or provide Super Grip Lock to employees, knowing that 25% of every product purchased at SuperGripLock.com or the National Neighborhood Watch website will be donated to buy bulletproof vests for Police Officers who need them. Learn more about the Bulletproof-Vest-Program at www.sheriffs.org/content/protect-protector. See if Super Grip Lock is right for your family or business at the National Neighborhood Watch websitewww.NNW.org. Click on Learn More to see a demo and watch the travel video then scroll down to select the offer that best fits the need. 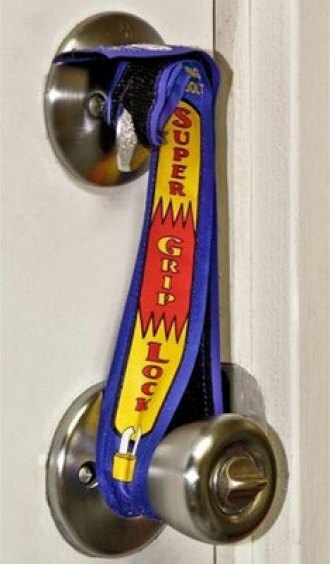 Also click on the Officer who volunteered his home so the public could see how Super Grip Lock worked in his home at www.SuperGripLock.com.